In-Store Display solution for Lowe’s tool area. Unique retail end cap display expands power tool appeal out on the floor. Lowes has a “designated” tool area that is segregated from the rest of the store with only one entrance/exit. This tool area is a low traffic area and is only visited by the predominantly male tool buying audience with little diversification. Furthermore, no power tool has ever been given “prime” floor positioning at the front of a store or at a register end cap. So the challenge was to come up with a solution that will expand the power tool audience beyond the traditional target. We needed to capture the female consumer without alienating the existing audience while adhering to the channels in-store display restrictions. Create a permanent register end cap display that is user friendly, but that has graphics that can be changed quarterly. By giving the display a house look it makes it appealing to a broader audience. Keeping the traditional Black & Decker branding statement and colors it maintains its familiarity to the core audience. Moreover, custom photography was shot, using everyday people of varying ages, gender and ethnic groups. Since it is an attractive permanent display that features unique specials and tools on quarterly basis its potential of generating increased sales easily moved the channel to agree to position it at the front of the store. A 67% increase of sales in a ten month period. And in some cases increasing individual product sales by 173%. Contact us today for a FREE Branding Consultation. We’ll discuss specific tactics that can help brand your business! Chances are you didn’t think too much about why you picked up one item over another the last time you were shopping for power tools. But someone did, and if the tool you chose was from Black & Decker, that someone was Karen Kerski, a Principal with Catalpha Advertising & Design in Towson, Maryland. 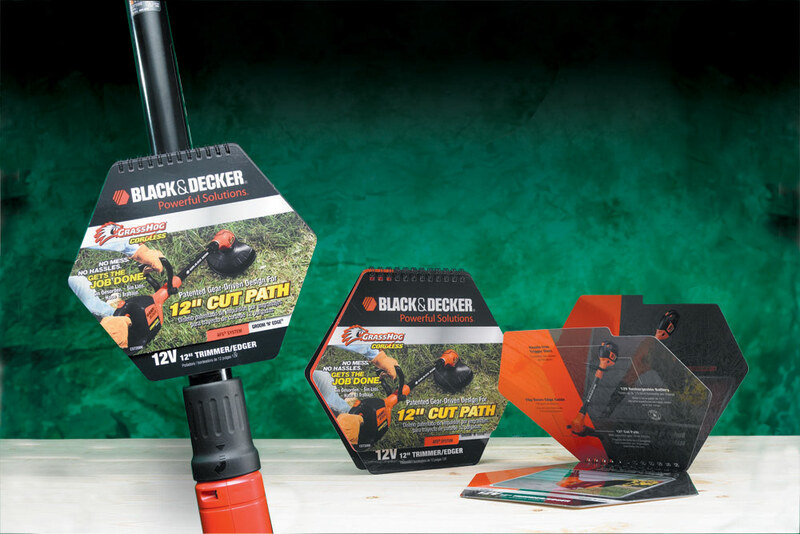 “We were given the challenge by Black & Decker to come up with an on-board point of purchase system that had to work on all of their outdoor products, be a strong branding tool with a step-up strategy, as well as educate the consumer and be durable enough to be on display for six months to a year without needing to be replaced,” explains Kerski. On-board POP means that whatever is used must attach to the tool. A label, for example, is on-board POP. And for Black & Decker, the on-board POP had to work within a broader context. With that big a challenge, where do you begin? Research, which in this case was a shopping trip. Kerski and the Black & Decker team, including Brand and Channel Managers, walked through several stores to get a feel for the varied display issues and opportunities. A major concern that had to be addressed was managing the different needs of the retailers who would be selling the products. Retailers need to eventually sell the display products, so the POP would have to be easily removed with no residue yet hold firmly for an extended period of time. And it had to fit into the retailers’ display space. Karen and the Catalpha team set to work. They knew from the start they wanted something unique, and a simple label wasn’t going to provide enough space for product information. 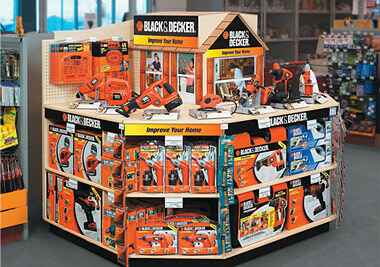 They wanted the higher-priced items to have POP that reflected the added value, but they wanted everything across all price-points to firmly identify the products as part of the Black & Decker family. After a week of development, Catalpha presented Black & Decker 3 solutions including graphic and production strategy for each concept. Black & Decker selected the concept that centered on a flipbook. The hex component of the Black & Decker logo is the key to all of the on-board POP. For the lowest price points, the hex was simple – a basic hangtag with just one benefit clearly spelled out. As you move up the line, the tag becomes more elaborate, turning into a spiral-bound flip-book complete with holograph and detailed benefit points for the most expensive options. Although the hang tags were elaborate, Catalpha had no concerns about the concept being unworkable. That’s because they make it a point that everything they present to their clients is feasible to produce. The design industry also found the designs to be winners. Catalpha’s designs for Black & Decker’s Leaf Hang Tag series, Hex Hang Tag series and Mower signs were honored with American Graphic Design Awards (http://www.gdusa.com) in 2005. We’ve helped clients in over 19 states successfully package their products! Risk-Free project consultation on your next packaging design project. Catalpha Successfully Packages Health & Beauty Product! 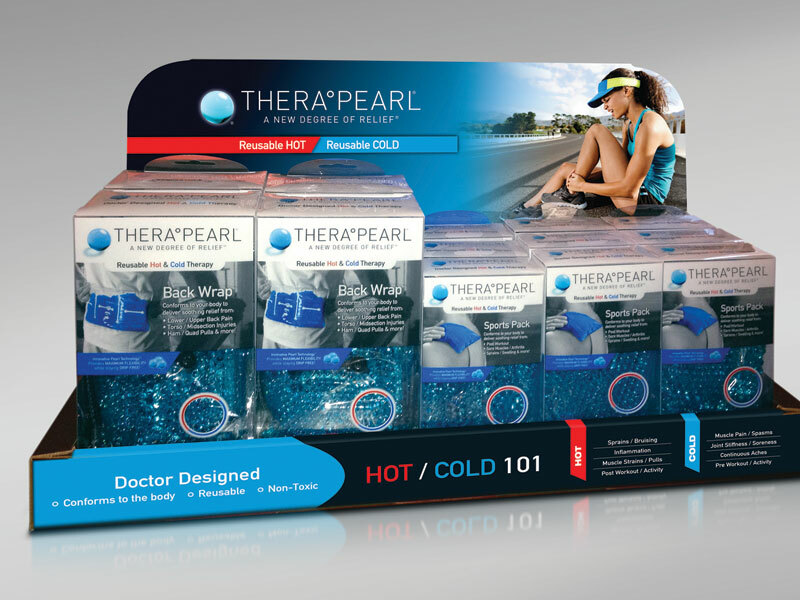 TheraPearl is the brainchild of a physician who saw the need for a unique therapeutic retail product that could be heated AND cooled. It also was made of translucent pearls that contoured to the body when applied. AND – they also were pretty to look at and enticing to touch! Catalpha was chosen (given our successful branding background) to create the package design for this unique health product. Upon completion of the initial set of four product packages – sales started to increase. This brought about additional products using the same brand. And packaging design was again needed to create a branded family appearance across all products. Even a children’s line of products was developed and Catalpha was again chosen to create the package design. The same brand has been transferred to a website as well as in-store displays and product literature by Catalpha. 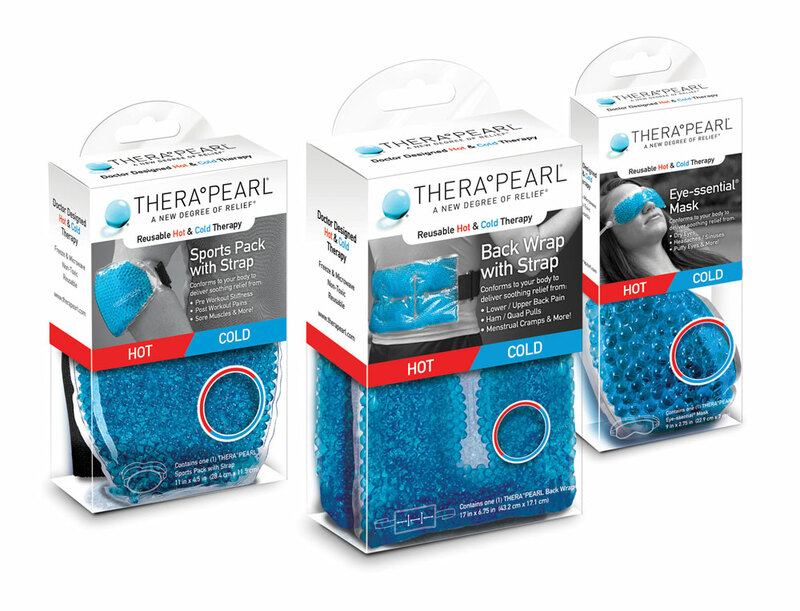 Watch for the TheraPearl products to be sold in a store near you.